Reproduces the direction and distance of the speaker. With high recording quality and superb stereo feeling, the WS series has established its presence as a smart tool for business. With the combination of the new Transcription Mode and Voice Playback function you can transcribe your recordings far more efficiently, enabling you to save time. 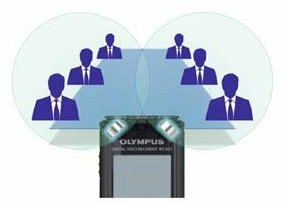 The recorder comes with a microSD slot and built-in USB, also featuring many more extensive business-oriented functions. With all the improvements it features, this series is becoming a must-have for business people. By positioning the two low-noise directional stereo microphones in a 90 degree layout, the WS series can record with superb stereo quality, taking into account the recording location, whether it is a meeting room or large conference center. The PCM recording format provides quality on par with CD recording. You can create the highest quality recordings with a bit rate of 16 bits and sampling frequency of 44.1kHz. The WS-822 was awarded six Dragons, the highest recognition rating when using Dragon NaturallySpeaking software from Nuance Communications, Inc. Dragon automatically turns your talk into text and can make virtually any computer task easier and faster. For more information, visit Nuance's website. 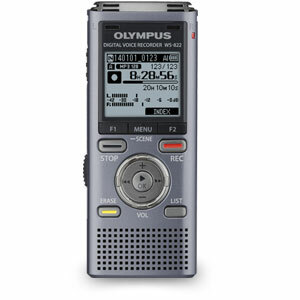 By using the Voice Playback function, the recorder skips the non-voice, dead air parts of the recording and only plays back parts where there is sound. For example, if 70% of the recording is conversation, a one-hour recording can be shortened to approximately 40 minutes. This allows more efficient transcription of your recordings. Transcription mode is one of the playback scene modes which helps users during transcription by eliminating dead air during playback. When recording meetings in large rooms, the recording levels of each sound tend to vary due to different distances and positional relationships with respect to sound sources. Even in these cases, the Voice Balancer function adjusts the volume levels of all speakers to a certain level so that it is more clear to hear on playback. Background noise which may have been captured during recording is powerfully reduced with the world's highest level of noise cancellation technology. 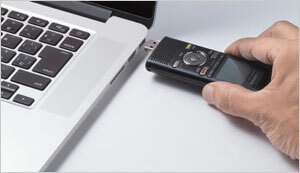 The USB connector integrated into the recorder can be easily deployed using the slide lever to plug the recorder directly into a PC. With no need for cables or special software, the transfer between PC and recorder is seamless. The recorder can even be used as a USB memory device. With 4 GB of internal memory and up to 1000 hours of recording time, you are able to capture notes, lectures, and more - and still have room to store documents. The WS-822 offers an impressive 37 hours of battery life. The recorder supports microSD cards up to 32GB for added space and memory, and it is located under the battery area to protect the card slot. Audio files saved on the recorder are automatically marked with the date. Because files are displayed by the calendar format, you can quickly find the file you are looking for by the date of recording. By simply selecting from the menu, you can set optimum recording settings according to the scenes. With five modes and three user configurations, anyone can easily make fail-proof, high-quality recordings, even in an environment requiring a quick response. Lecture: Suitable for recording a lecture in a large room where there are many people. Conference: For clear recording in a conference room with some people. Meeting: To record conversations in a small meeting room. Dictation: Optimum to capture your speech by talking directly into the recorder. DNS: Provides the best settings for voice recognition with Dragon NaturallySpeaking by Nuance Inc. Size 4" x 1.6" x .6" 4" x 1.6" x .6" 4.5" x 2" x .7"
Weight (including battery) 1.9 oz. 1.9 oz. 3.7 oz.